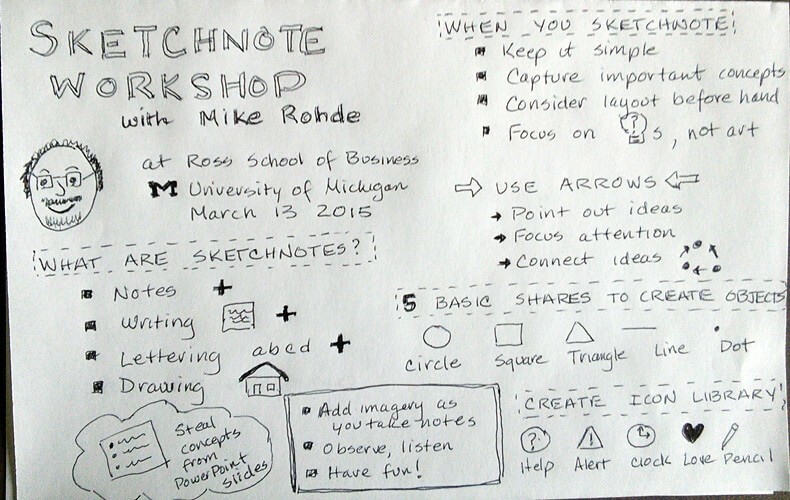 When Mike Rohde came to Ann Arbor a couple weeks ago to teach sketchnote workshops, he graciously offered to meet up and chat with people in our design community. Local designers, an engineer, user experience folks, and a librarian joined us for a great evening at The Songbird Cafe. We chatted about design, books, our favorite pens, and sketchnoting. And thanks to Mike and Nikki McDonald, senior acquisitions editor at Peachpit Press and New Riders, people who attended the meetup received free sketchnoting books and great-looking sketchnote stickers. How lovely! 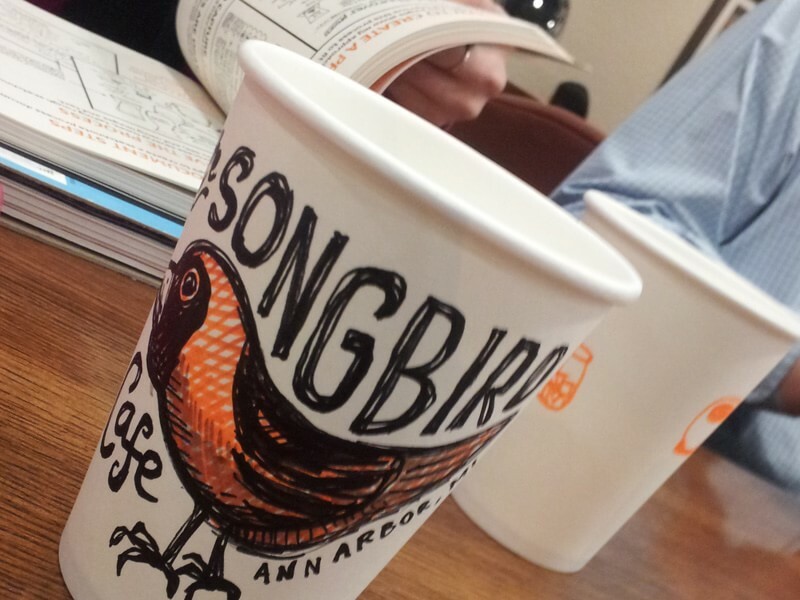 The staff at The Songbird Cafe loved the sketchnoted coffee cup Mike left behind. The following day I joined Mike at his afternoon workshop for Ross School of Business students at the University of Michigan. What fun! While Mike explained the basic concepts of sketchnoting, I sketchnoted his talk. Note: I’m a beginner at sketchnoting (I usually live tweet events and conferences). Be gentle with your remarks on my work. Check out the key takeaways from the sketchnotes. Steal concepts from PowerPoint slides. Create an icon library you can use throughout your sketchnotes. Create images for ideas/concepts you repeat: help, alert, clock (time), love, pencil, etc. Add imagery as you take notes. Observe, listen, and have fun! Throughout the workshop, Mike gave us mini-assignments to sketchnote. We had a lot of fun learning how to draw faces, people, and other objects from the five elements. We also createed sketchnotes of our ideal treehouse, the perfect lemonade stand, and business icon concepts. I was impressed with the treehouses students created, with slides, waterfalls, and one even had a pulley. Students shared their work, presented their sketch, and explained their thought process. If you haven’t tried sketchnoting, give it a whirl! It’s fun, you don’t need to know how to draw, and it’s a cool way to capture notes. Check out Mike’s sketchnote handbook and the sketchnotes others have created. It was great to see Mike again. I had a wonderful time at the meetup and workshop! And I hope we’ll see Mike return to Ann Arbor soon.